Mosquitoes are unpleasant, and like many things in life that are unpleasant – they are tough to get rid of. Mosquitoes are attracted to stationary bodies of water and this is precisely what ponds and water gardens provide. Many enthusiasts have struggled looking for ways to keep mosquitoes away, using sprays and various forms of pest control, with limited results. Below are some tips which are far more effective. 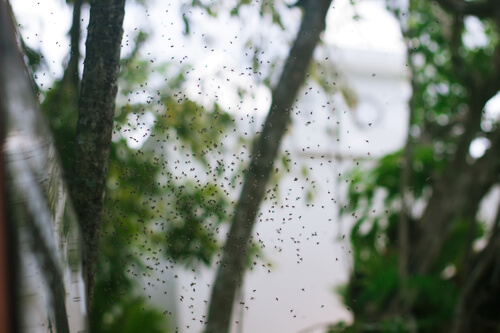 The mosquito dunk is another way to deal with ponds that have still or stagnant water. They come in the form of disks that have Bt-I, or Bt-israelensis, which is a type of biological pesticide which is designed to eradicate the mosquito larvae. You would take the mosquito dunk and throw it into your pond or water garden and it will wipe out the mosquitoes for a period of about thirty days. Best of all, they are perfectly safe to use around both pets and children. Mosquitoes prefer water which is stagnant, especially the females. This is so they can lay eggs, and pond owners who allow their ponds to fall into disrepair will cause the appearance of bacteria, plankton and algae which is a perfect breeding ground for mosquitoes. The key to keeping mosquitoes away is a healthy, vibrant pond or water garden with lots of moving water. The best way to get the water moving is through fountains or waterfalls which maintain moving currents so that mosquitoes aren’t able to lay their eggs. Ensure your pond is cleaned regularly. There are a number of fish and other species that enjoy eating mosquitoes, and you should consider adding them to your pond to keep these insects at bay. Some of these animals include tadpoles, catfish, bass, minnow and bluegill. These animals will not only keep the mosquito population under control, but will eat other types of insects as well. The next best thing to filling the pond with animals that eat mosquitoes is getting rid of the food sources that mosquitoes thrive on. Any water garden or pond that is rich in algae or other types of plants will form a perfect breeding spot for mosquitoes. This is because the mosquito pupae consume the greens, but by reducing the algae and plants their population will decline dramatically. Mosquitoes reside primarily in the debris which encapsulates the pond. Wise pond owners keep these areas clear, which can be done using various types of herbicide to exterminate the aquatic grass and weed. Make use of weed removal tools such as rakes and cutters to get rid of overgrowth, decaying plants, and any other hiding spots that mosquitoes can use. Mosquitoes are more than just irritating, they’ve been linked to the spread of a number of diseases, including yellow fever, encephalitis and malaria. Unlike most insects, they provide few benefits to the ecosystem and some scientists have considered the possibility of exterminating them completely. In the meantime, these solutions will keep them out of your pond.